In 1954 Congress enacted disability "freeze" legislation that protected a disabled workers rights to eventual retirement benefits (this was two years before cash disability benefits were passed into law). 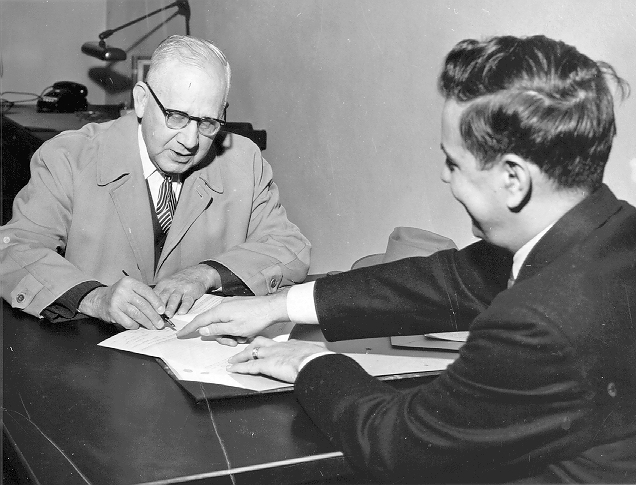 This photo shows the first disability freeze application being taken in the Wheeling, West Virginia office on January 2, 1955. The applicant (left) is Mr. William Calvin King. The claim is being taken by the local Social Security office manager, Edgar Allen Poe (no foolin'! ).